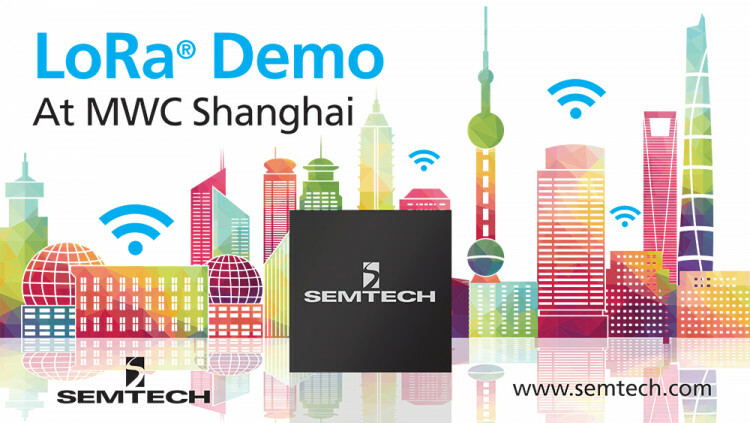 CAMARILLO, Calif., June 8, 2017 – Semtech Corporation (Nasdaq: SMTC), a leading supplier of analog and mixed-signal semiconductors, announced that it will demonstrate its LoRa® wireless products and RF Technology (LoRa Technology) at Mobile World Congress (MWC) Shanghai from June 28-July 1. This year’s MWC Shanghai will focus on cutting-edge products and technology that will define the future including Internet of Things (IoT). Along with companies from the LoRa Alliance™, Semtech will demonstrate its LoRa Technology specifically displaying the broad range of next-generation IoT networks, gateways, sensors, module products, and services it enables. End-to-end IoT solutions embedded with LoRa Technology are available now and being deployed worldwide in a variety of LPWA applications to solve real-world problems including Smart Cities and Smart Metering. With LoRa Technology’s deep penetration capability and low-power performance, users can closely monitor water, gas and electricity consumption to improve efficiency and reduce costs. Smart parking solutions, asset tracking and environment sensors are helping reduce traffic congestion throughout cities while monitoring pollution levels at a safe level. The IoT Pavilion will be exhibiting in Hall W5 Booth #96. For show information, visit the MWC Shanghai website. • Low Power: The LoRaWAN™ protocol was developed specifically for low power and enables unprecedented battery lifetime of up to 20 years depending on the application. • Open Standard: The LoRaWAN protocol ensures interoperability among applications, IoT solution providers and telecom operators to speed adoption and deployment. • Learn how LoRa enables IoT visit Semtech’s LoRa/IoT site. • Engage with the LoRa Community to access free training as well as an online industry catalog showcasing next-generation products. • Sign up for Semtech’s e-newsletter Inside Circuit for quarterly product updates.